This is the third of four articles analyzing the new US Department of Defense Law of War Manual. By authorizing the Pentagon to occupy, wage war against and impose its own version of “law” in every corner of the planet, the DOD manual merely formalizes the world-hegemonic agenda of US imperialism and points to its logical endpoint. “US capitalism is up against the same problems that pushed Germany in 1914 on the path of war. The world is divided? It must be redivided. For Germany it was a question of ‘organizing Europe.’ The United States must ‘organize’ the world. History is bringing humanity face to face with the volcanic eruption of American imperialism.” This was written by the founder of the Fourth International, Leon Trotsky, in 1934. From the mid-1970s onward, the US ruling class has engaged in a relentless militarization drive aimed at overcoming through armed force its economic decline. The Law of War Manual, which elaborates protocols for military operations in every corner of the globe by the Pentagon and its proxy forces, amounts to a manifesto for this process, set down in legal jargon. If the guidelines laid out in the manual are allowed to be implemented—that is, if the international working class does not intervene in time on the basis of a revolutionary program—then humankind faces a future dominated by concentration camps, slaughter on an unprecedented scale, and, ultimately, a nuclear holocaust. Every nominal restriction on the DOD’s war-making powers included in the manual is accompanied by caveats that confer virtually unlimited discretion on US military commanders to employ violence in the service of US strategic aims. The manual carefully avoids any language that might discourage commanders from planning offensive operations. There are gaping loopholes in every section designed to instill confidence that there will be no penalty for the indiscriminate use of force. The manual authorizes US commanders to engage in strategic bombing, attacks on civilian commercial infrastructure, blockades and sieges. It authorizes the establishment of mass detention and forced labor camps. Of course, throughout its history, US imperialism has committed horrific violations of international laws along these lines, carrying out collective punishment, mass slaughter of populations, and the destruction of urban areas in Germany, Japan, Korea, Vietnam, Cambodia and, most recently, Iraq. The military campaign launched against Iraq in 2003 reduced one of the most advanced economies in the Middle East to a level of social development comparable to that of the poorest countries in the world. Some 4-5 million Iraqis were killed, displaced or disappeared as a result of the US war and occupation. More than half of Iraqi doctors were killed or forced to flee the country. Reports published in 2007 by Iraq’s Statistical Bureau showed that, four years after the war was launched, fully 43 percent of Iraqis were living in “absolute poverty,” without reliable access to food, housing or clothing. Prior to the release of the DOD manual this year, however, the US high command employed such methods in defiance of its own regulations, which still included clearly worded prohibitions against wanton destruction of civilian infrastructure and populations. The last comprehensive document on military law issued by the US Department of Defense, the 1956 US Army Field Manual on the Law of Land Warfare, still maintained that military operations could not be launched if it was known in advance that they would lead to large-scale civilian casualties. While including formal prohibitions against the slaughter of civilians similar to those contained in the 1956 document, the new manual provides conceptual loopholes based on notions of “military necessity,” “expected military advantage,” etc. The publication of the DOD manual is thus enormously significant as an official assertion by the US ruling elite of its “right” to demolish entire societies and peoples in pursuit of its political goals. Undoubtedly, the DOD manual was crafted with an eye toward legalizing, after the fact, the crimes committed against Iraq by US imperialism. Commanders are authorized to conduct operations that they know will lead to large numbers of civilian deaths, as long as their subjective assessment finds that such operations contribute to “the broader imperatives of winning the war.” This applies even when the “military advantage” to be gained from a proposed attack could not be understood by an “outside observer,” i.e., on the basis of any objective or universal criteria. “The term ‘military objective’ means combatants and those objects during hostilities which, by their nature, location, purpose, or use, effectively contribute to the war-fighting or war-sustaining capability of an opposing force,” the manual reads. In a critique of the target selection practices called for by the manual, entitled “The Defense Department Stands Alone on Target Selection,” Professor Adil Haque of the Rutgers School of Law-Newark notes that the manual effectively authorizes US commanders to carry out attacks regardless of the civilian death toll that is likely to result. Large sections of the manual are devoted to siege, enforced starvation and occupation of densely populated urban areas. It authorizes the erection of ghettos and security cordons to restrict the movement of civilians. It advises US officers to allow passage of “certain categories of civilians,” implying that much of the civilian population can be left for dead inside the encircled area. Commanders are authorized to completely isolate urban areas, refusing the movement of even the most basic humanitarian goods into the siege zone. The implications of this doctrine were already demonstrated in the US military’s 2004 siege of Fallujah in Iraq. Tens of thousands of Iraqi men between the ages of 15 and 55 were prevented from fleeing the city prior to a devastating US bombardment that destroyed some 60 percent of the city’s buildings, irradiated the entire area with toxic munitions byproducts, and permanently reduced the population by as much as 50 percent. Such formulations amount to a green light to do anything. Would the DOD high command consider the destruction of China’s key military and economic infrastructure to be militarily advantageous? Of course, and therefore nuclear attacks would be justified. In fact, the DOD’s Air Sea battle plan envisions a crushing first strike against the Chinese mainland, using a level of force so overwhelming as to prevent any possibility of retaliation by the Chinese military. While the executive branch has already asserted similar prerogatives with the passage of the National Defense Authorization Act of 2012, it remains significant that the DOD now openly maintains its own sweeping powers to act as an independent branch of government, exercising essentially limitless authority. The manual maintains that the Defense Department may re-interpret and negate international agreements that prohibit extra-legal arrests and detentions, upholding the unlimited right of the American national state to nullify well-established international laws. The DOD lawyers go so far as to cite relevant portions of international law that directly contradict their own positions before sweeping them aside as incompatible with the US government’s interpretations. The document then declares that the US government has “understood” such prohibitions not to apply to its own policies. 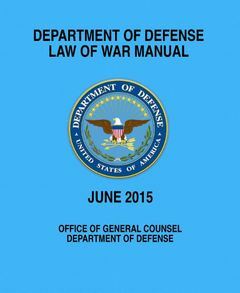 As far as DOD and the US government are concerned, the manual makes clear, the content of international laws is determined by the way in which such laws are re-understood by top US military attorneys and bureaucrats. “For example, the right to challenge the lawfulness of an arrest before a court provided in Article 9 of the International Covenant on Civil and Political Rights (ICCPR) would appear to conflict with the authority under the law of war to detain certain persons without judicial process or criminal charge,” the manual reads. The manual outlines procedures for military occupation and imposition of martial law on subjugated territories. Protocols are formulated in extremely general terms, making clear that the entire world, including the US “Homeland,” is viewed as actual or potential Occupied Territory. US commanders may “exercise authority over all means of public and private transportation, whether land, waterborne, or air, within the occupied territory, and may seize them and regulate their operation,” the manual asserts. Lest there be any illusions that protocols for military occupation and suspension of constitutional government do not apply within the borders of the United States, the manual announces that the DOD-promulgated law of war policies are being integrated into US domestic law. “Law of war requirements have also been incorporated into domestic law, policy, regulations, and orders,” the document states (P. 1,057). In the section on “Non-International Armed Conflict,” the manual develops another conceptual loophole that enables US forces to violate the Geneva Conventions and other international laws when engaged in operations against persons or organizations that are not formally part of an internationally recognized state. Whereas the manual assigns some limited relevance to international laws in relation to military conflicts against rival national states, non-international armed conflicts are said to be conducted under the essentially limitless authorities assigned by the manual to the US government as the world’s most powerful national state. Non-state actors cannot claim the legal status of national governments and are essentially considered to be legally naked, that is, fully at the mercy of the US government and not entitled to the minimal protections afforded to captured enemy POWs. Such language serves to put US officers on notice that, in confronting insurrectionary movements by the American and international working class, they are permitted to cast aside all restraints conventionally associated with the law of war as it has evolved over centuries.